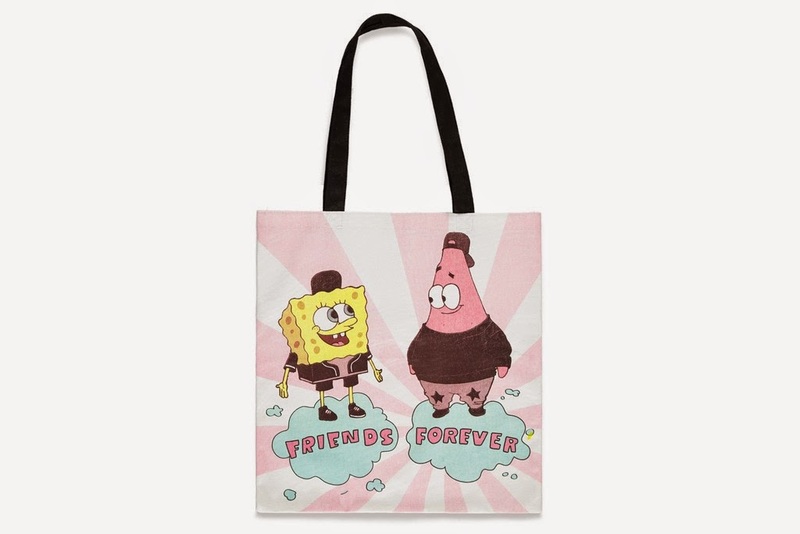 To celebrate the Nickelodeon Kids' Choice Awards 2015, Fun Kids and Pop Scoop! have unveiled exclusive video interviews with Diversity stars Jordan Banjo and Perri Kiely, the UK hosts of the 2015 KCAs, which you can watch in the online streaming video clips below! 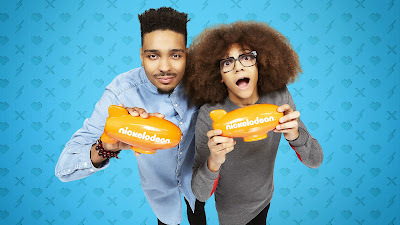 In the interviews, Jordan and Perri talk about Nickelodeon's 2015 Kids' Choice Awards, including who's been nominated, who they hope will win a coveted orange blimp award (including Joey Essex's Cat, Prince Essex), and who they hope to meet at Nick's annual slimefest, plus what it was like to present the Nickelodeon Kids' Choice Awards 2014, which celebrities they got to meet whilst hosting, and what it was like for Perri to get slimed during "Xmas Slime" in December 2014! Jordan also talks about how he hopes to be slimed at Nickelodeon's Kids' Choice Awards 2015, how happy he is that Directioners have been nominated for a Kids' Choice Award, and reveals that he's a big fan of anime video games! Kids can now cast their votes across the seven already announced UK categories and the 21 international categories, including new additions: Favourite Talent Competition Show, Favourite Family TV Show, Most Addicting Game and Favourite New Artist, across all of Nickelodeon's digital platforms including kca.nick.co.uk/vote, on The Nick App and via Twitter using the hashtag #KCA. You can find a full list of Kids' Choice Awards 2015 Twitter voting hashtags here on NickALive!. Furthermore, fans can join in on the slime-fest by going to kca.nick.co.uk. Fans can vote for their favourites as many times as they like until voting closes on Saturday 28th March 2015. Nickelodeon UK and Ireland and Nickelodeon HD UK will premiere and show the "2015 Nickelodeon's Kids' Choice Awards", "Nickelodeon's 28th Annual Kids' Choice Awards", hosted by Nick Jonas, Jordan Banjo and Perri Kiely, on Sunday 29th March 2015 at 5:00pm (repeated at 6:00pm on Nickelodeon +1), giving Nick's UK and Irish audiences the opportunity to see all of the slime and star action less than 24 hours after the live US show, which will take place in Los Angeles' legendary 'Fabulous' Forum for the first-time ever on Saturday 28th March 2015! The awards will also encore on Channel 5 on Sunday 5th April 2015. Plus, tune in to "Road to the KCAs" every Friday from 4:00pm on Nickelodeon UK and Ireland/HD (repeated from 5:00pm on Nick+1) and follow Jordan and Perri as they tour the United States, sending back the very latest Orange Carpet gossip, showcasing the very best of Nickelodeon and covering all the excitement in the build-up to this years slime-tastic extravaganza! Follow NickALive! on Twitter, Tumblr, Google+, via RSS, on Instagram, and/or Facebook for the latest Nickelodeon Kids' Choice Awards 2015 News and Highlights! During Nickelodeon's annual upfront presentation, Nickelodeon Upfront 2015, Nickelodeon treated their audience to a bit of industry humor with the debut of a short parody starring Benjamin "Lil P-Nut" Flores Jr. and Breanna Yde, who play Louie Preston and Frankie Hathaway, respectively, on Nickelodeon's hit supernatural-themed live-action comedy series "The Haunted Hathaways"! While hanging out in the Viacom offices in Times Square, the curious child stars stumble upon a fictitious book titled "Counting for Dummies: A Comprehensive Guide to TV Measurement". 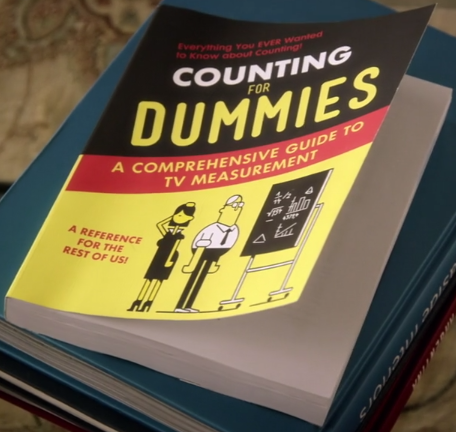 Counting for Dummies: A Comprehensive Guide to TV Measurement from Viacom on Vimeo. Source: Blog.Viacom, Viacom's corporate blog. Nickelodeon USA has announced the fantastic news in their new teaser trailer that Nick USA will start to premiere and show Nickelodeon's brand-new original animated series "Harvey Beaks" on Sunday 29th March 2015 at 7:00 PM (ET/PT)! NickHeads can watch Nickelodeon USA's latest "Harvey Beaks" promo here on Toon Zone! 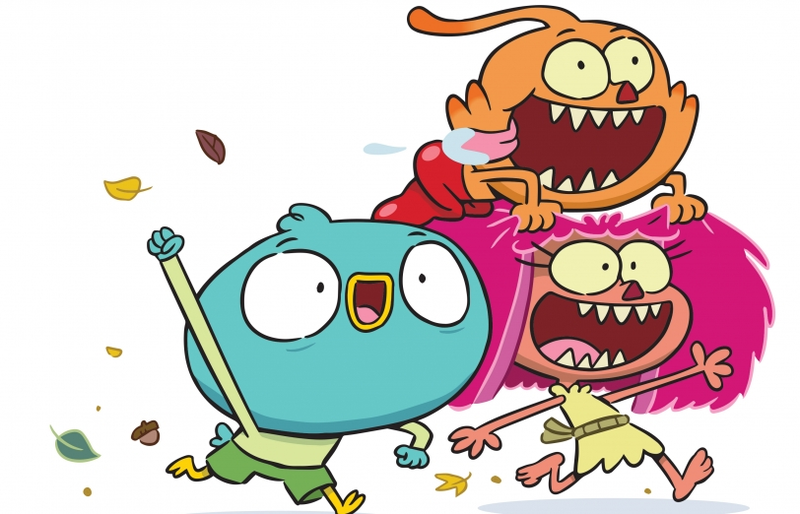 A mild-mannered bird and his two wild best friends embark on a series of hilarious adventures in Nickelodeon's brand-new animated series "Harvey Beaks" (formally titled "Bad Seeds"). This 26-episode series, created and executive produced by C.H. Greenblatt ("Chowder"), tells the story of the unlikely friendship between Harvey, a kid who's never broken the rules, and Fee and Foo, his two friends who've never lived by any. Set in a magical forest, this new series follows one sweet bird on his mission to experience wild adventures with the help of his two best friends. 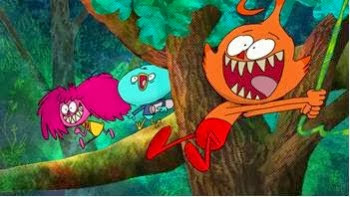 Harvey, Fee and Foo's connection only grows stronger throughout the series as they push each other into endless fun. Viewers can visit the "Harvey Beaks" page on Nick.com and the Nick App to learn more about the show and its characters, get a behind-the-scenes look at the series and play new games beginning March 26, including "Harvey Beaks Pe-Choo!" and take the quiz "Which Character Are You?". 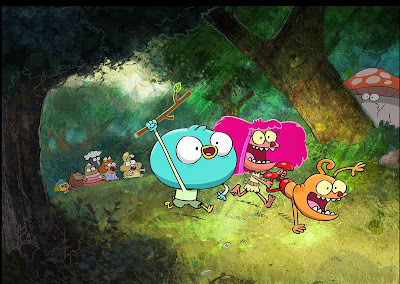 Episodes of Harvey Beaks will be available on Nick.com and the Nick App, along with platforms including iTunes, Amazon, Xbox, Google Play, Vudu, Playstation, Hulu and VOD. Greenblatt began his career in animation as a storyboard artist and writer on Nickelodeon's "SpongeBob SquarePants". He created and executive produced "Chowder" and was a storyboard artist and writer for "The Grim Adventures of Billy & Mandy" at Cartoon Network. He also directed his own version of the character "Deadman" for DC Nation shorts. Nickelodeon USA To Premiere Brand-New "SpongeBob SquarePants" Episode "Yeti Krabs" On Sunday 29th March 2015! Very Important Update - Nickelodeon USA WILL be premiering the brand-new "SpongeBob SquarePants" episode "Yeti Krabs" on Sunday 29th March 2015 at 7:00pm, followed by the world premiere of Nickelodeon's brand-new Nicktoon "Harvey Beaks"! I apologise for any confusion and inconvenience caused by my last update. 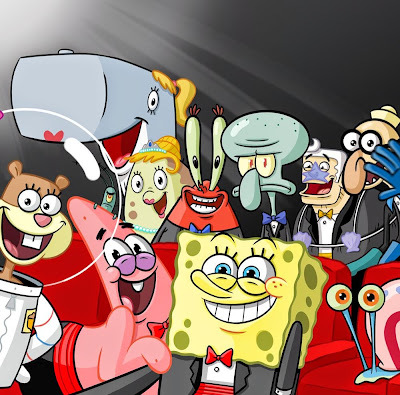 The television news website The Futon Critic is reporting the exciting Nick News that Nickelodeon USA will premiere and show a brand-new episode of the networks hit original animated series "SpongeBob SquarePants" titled "Yeti Krabs" on Sunday 29th March 2015 at 7:00pm (ET/PT)! In the all-new SBSP episode, which is the partner episode of "Kenny the Cat", Squidward stops doing work at the Krusty Krab, so Mr. Krabs tells a scary story about a yeti crab that eats lazy employees, which causes SpongeBob to take it seriously and start working in overdrive! Source: ToonZone forum member J21697. (February 26, 2015 – Toronto, Canada) This March YTV is pulling out all the stops for a month filled with new series, movies and marathons, all leading up to three incredible, breath-taking live events that will make the channel the place to be. The channel has a lineup stacked with new episodes as well as two new highly anticipated live-action comedies. Bella and the Bulldogs launches on Wednesday, March 18 at 7 p.m. ET/PT and The Stanley Dynamic will debut on Thursday, March 19 at 7:30 p.m. ET/PT. YTV is also set to reveal a huge treat for viewers on March 20, when a major recording artist will perform live on The Zone. Details to come. And March will go out with a roar, when YTV gives viewers front row seats to the most exciting kids' night of the year, starting with the live pre-show Kids' Choice Countdown hosted by The Zone's Carlos and followed by the live telecast of Nickelodeon's Kids Choice Awards on Saturday, March 28. "We're thrilled to be giving our viewers the most exciting March Break lineup in YTV history," said Jocelyn Hamilton, Vice President, Programming and Original Prodcutions, Corus Kids. "Not only is our programming schedule packed with new series and episodes and great movies, but kids are in for a real treat with the adventures that YTV stars will take them on with Mucho Marcho Mission and the incredible surprise performance we have planned to wrap up the week." Viewers can also look forward to a new season of Numb Chucks and new episodes of Some Assembly Required, Max and Shred, The Haunted Hathaways, Henry Danger, The Thundermans and Nicky, Ricky, Dicky, and Dawn. During March Break, March 16 to March 20, YTV will the #1 place to be while school's out with movie marathons every day from 9 a.m. to 4 p.m. ET/PT and The Zone's week-long Mucho Marcho Mission Starting Monday, March 16, Carlos and The Zone gang are partaking in a daily Mucho Marcho Mission in which they will each get to do something they've always wanted to experience, like riding in a helicopter or flying on a trapeze, and take another YTV star along with them. Mucho Marcho Mission will culminate on Friday, March 20 with an incredible live performance from a major recording artist. Visit YTV.com and follow @YTV for more details on Mucho Marcho Mission's daily challenges and the exciting reveal of the international singing sensation slated for the Friday finale. Head cheerleader, Bella's life takes an unexpected twist when her amazing throwing arm takes her from the sidelines to becoming the starting quarterback of her Texas middle school football team, the Bulldogs. In this new comedy Bella Dawson, a confident, caring and talented teenager, suddenly finds herself fulfilling a lifelong dream but also having to navigate the world of her teammates Troy, Sawyer and Newt, without losing her two best friends, Pepper and Sophie from the cheer squad. The Stanley Dynamic, a hilarious multi-cam sitcom centres around The Stanleys, a normal family with one big twist—one of their twin sons is animated. The 14-year-old twins, Larry and his cartoon twin brother Luke, navigate their first year of high school and try to fit in. Luke prefers to stay under the radar, but his ability to stretch his body like a wad of gum keeps him in the spotlight, while Larry's love of attention constantly backfires and results in him getting into a lot of trouble. Luckily, the twins have the support of their little sister, their mom and their cartoonist dad who chronicles the family's adventures in his online comic strip. Together the Stanleys juggle home life, school and work in a way that stretches their relationship with each other and the world in all kinds of unexpected ways. YTV will debut its first-ever live pre-show leading up to the 28th Annual Kids Choice Awards, with The Zone's Carlos reporting direct from the Orange Carpet in L.A. As the stars arrive The Zone's Suki and Lisa Gilroy will co-anchor the show in front of a live YTV studio audience, along with appearances from YTV's Duhin, Victor and kid contributors Miley and Ethan, as they relay the action and keep fans up-to-date with what's trending in each award category. Audience members and viewers at home will be able to share their countdown moments using #YTVKCALive for the chance to be selected for customized social shout outs. Just in time for the main event, the preshow will end with the ultimate KCA moment, when one of the YTV hosts gets slimed! YTV will air Nickelodeon's 28th Annual Kids' Choice Awards live on Saturday, March 28 at 8 p.m. ET/PT and the show will be simulcast on Nickelodeon (Canada). Multi-talented singer/songwriter and actor Nick Jonas is set to take the stage from L.A.'s legendary 'Fabulous' Forum. With four new categories added, this year's new nominees include Iggy Azalea, Sam Smith, Angelina Jolie, 5 Seconds of Summer, Channing Tatum, Meryl Streep, Meghan Trainor, Chris Pratt, Fifth Harmony, Echosmith, Jessie J, Liam Hemsworth, Elle Fanning, Imagine Dragons, Kira Kosdearin and Laura Marano. Kids also picked superstar nominees Beyoncé, Cameron Diaz, Jamie Foxx, Ariana Grande, OneRepublic, Hugh Jackman, Bruno Mars, Nicki Minaj, Ben Stiller, One Direction, Katy Perry, Taylor Swift, Jennifer Garner, Maroon 5, Scarlett Johansson and more. Pirate Captain sets out on a mission to defeat his rivals for the Pirate of the year Award. The Pirates! Band of Misfits premieres Sunday, March15 at 6 p.m.
A video game villain wants to be a hero but his quest brings havoc to his world. Wreck-it Ralph premieres Friday, March 20 at 7:30 p.m.
Barry the Bee develops a relationship with a florist in New York City, and as their relationship develops, Barry discovers humans eat honey, and he decides to sue them. The Bee Movie premieres Sunday, March 22 at 6 p.m.
Megamind (2010) airs at 2:05 p.m. Celebrating 25 years in television, YTV is a leading cross platform entertainment brand for kids and families. The channel offers quality entertainment with hilarious animated and live-action comedy series, popular Nickelodeon series, blockbuster movies, top-rated original Canadian programming, music, celebrities and the channel's after-school block, The Zone. Through its multiple platforms and exclusive digital and interactive content, YTV is the voice of Canadian youth culture. YTV is owned by Corus Entertainment Inc. Follow NickALive! on Twitter, Tumblr, Google+, via RSS, on Instagram, and/or Facebook for all the latest Nickelodeon on YTV News and Highlights! When Max & Phoebe accidentally sell one of their mom's old superhero accessories, they make a mad dash to recover it before she realizes what they've done. Will they get it back in time? Find out on "Who's Your Mommy", this Monday (3/2) at 7/6c! Max races rats with his friends, and will stop at nothing to win, including turning his little brother into a rodent. See what Billy thinks about the whole ordeal in "The Amazing Rat Race", airing this Tuesday (3/3) at 7/6c. Follow NickALive! on Twitter, Tumblr, Google+, via RSS, on Instagram, and/or Facebook for the latest Nickelodeon and AwesomenessTV News and Highlights! 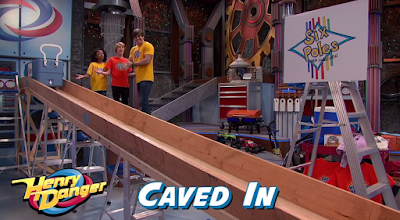 To celebrate Nickelodeon USA premiering and showing the next brand-new episode of the networks new hit original comedy series "Henry Danger", called "Caved In", on Saturday 28th February 2015 at 8:00pm (ET/PT) as part of Nick USA's all-new 'New Saturday Night' programming block, Just Jared Jr. has unveiled a exclusive sneak peek preview from the all-new episode, which you can watch in the online streaming video clip here on JustJaredJr.com! In "Caved In", directed by "iCarly" star Nathan Kress, the gang finds out that Ray (Cooper Barnes) became invincible at such a young age and he missed out on a "normal" childhood. To help make up for the things he didn't experience as a kid, Henry (Jace Norman) and Charlotte (Riele Downs) plan a weekend full of childlike fun – riding bikes, camping and even going to their very own amusement park, Six Poles Over Swellview! Hop on in and enjoy the ride this Saturday at 8/7c with a this week's new episode! "I'm so honored to have been given the opportunity to step behind the camera for such a big project, especially at such a young age," the 21-year-old actor dished to The Wrap. Nathan added, "I don't take the responsibility lightly. I've been preparing for over a month and I can’t wait to flex a different creative muscle in the coming week!" A new girl called Nikki (Madison Grace (Guthrie), "Law & Order: Special Victims Unit") has taken over Bella's spot on the cheerleading squad, but has she also taken over her friendships with Sophie and Pepper? Find out on a new Bella and The Bulldogs this Saturday at 9/8c. So excited to announce that #Thundermans is coming back for SEASON 3!!! [thunder emoji]Keep your eyes on @NickelodeonTV for more info! [...] Production will start this summer. 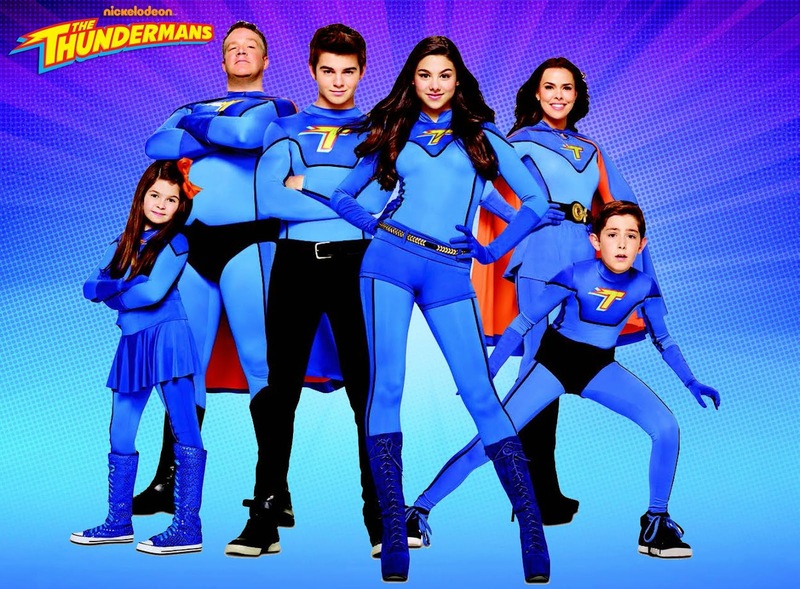 Phoebe and Max Thunderman (Kira Kosarin and Jack Griffo) are 14-year-old fraternal twins turbocharged by freeze breath and the power to move objects via telekinesis. Brother Billy (Diego Velazquez) moves at super speed, while younger sister Nora (Addison Riecke) cuts solid objects with her laser beam eyes. Rounding out the family are parents Hank (Chris Tallman), who possesses extraordinary strength and the ability to fly, and Barb (Rosa Blasi), who can generate lightning from her hands. Source: Toon Zone forum member NickDisneyCartoo. The Associated Press has unveiled a exclusive interview with Sarah Kirshbaum Levy, Nickelodeon's Chief Operating Officer, in which Sarah talks about some of the exciting news Nickelodeon announced during Nickelodeon Upfront 2015 on Wednesday 25th February 2015. In the interview, Sarah talks about Noggin, Nickelodeon's upcoming new ad-free mobile subscription service for preschoolers, and announces that Nickelodeon's potential "SpongeBob SquarePants" Broadway musical will feature a original song written by Aerosmith and a classic song by David Bowie! NEW YORK - Nickelodeon is creating brand-new content and resurrecting old shows for a mobile subscription service aimed at preschoolers. The $6-a-month service called Noggin will have new games and activities alongside archives of shows no longer on any of Nickelodeon's TV channels. That includes videos of characters Moose and Zee teaching letters, shapes and other pre-kindergarten skills. And on the heels of a successful "SpongeBob" movie, Nickelodeon is also developing a musical based on the cartoon character for a potential run on Broadway. Aerosmith has written a song for it, while David Bowie will contribute an old song. But there's no word yet on when it might premiere, if ever. "It's not definite. We're still workshopping the show. We do think it has great potential," Sarah Kirshbaum Levy, Nickelodeon's chief operating officer, told The Associated Press. As for Noggin, the ad-free service will debut next Thursday on Apple mobile devices. An Android version will follow. Although the videos will initially come from Nickelodeon's archives, Levy said new episodes may follow. She said the impetus came from Nickelodeon seeing rivals thrive with archives of content, while its own "deep, rich library" went untapped. "Sesame Street," for instance, offers its archives online for $4 a month. Levy said Nickelodeon didn't see enough broad-reach, television demand for the older content, but thought there would be enough interest on demand. The company is calling Noggin "separate and distinct" from the Nick Jr. preschool channel because the Noggin shows are no longer shown on TV. Although a few cable channels such as HBO are planning stand-alone streaming subscriptions as alternatives to a cable package, most channels are sticking with existing distributors. In this case, Nickelodeon said it's in talks with pay-TV providers to bundle Noggin with cable and satellite packages. The regular Nick Jr. channel is available through a separate Nick Jr. app, but it requires a pay-TV subscription and isn't sold as a stand-alone subscription. Levy said Nickelodeon's four traditional channels will remain its core business, and there aren't any current plans to offer similar services for older children. New York-based Viacom Inc., which owns Nickelodeon, did announce stand-alone subscriptions around its MTV brand this week. The MTV Play video service, launching next Thursday, will offer archives of past content and previews of new shows. It will be initially available only in Germany, Switzerland and Romania, however. The MTV Trax music service will launch Tuesday in the U.K. and expand later to New Zealand. Both services will be aimed at mobile users. Viacom hinted at the Noggin service last month, but details weren't unveiled until Wednesday at Nickelodeon's annual presentation to ad buyers and other marketers on upcoming shows. Noggin is the original name of the Nick Jr. channel and was chosen partly because moms are already familiar with the brand, said Cyma Zarghami, president of the kids and family group at Viacom. Follow NickALive! on Twitter, Tumblr, Google+, via RSS, on Instagram, and/or Facebook for the latest Nickelodeon Upfront News and Highlights! Pictured: Noggin is a new mobile subscription service for preschoolers from Nickelodeon. Photo Credit: Nickelodeon. ©2015 Viacom International, Inc. All Rights Reserved. NEW YORK--(BUSINESS WIRE)--Nickelodeon, at its annual upfront presentation today, unveiled Noggin--a new mobile subscription service for preschoolers. Available on the App Store for iPhone, iPad and iPod touch starting March 5, the paid service will be ad-free and offered for $5.99 a month. Nickelodeon is also in discussions with distributors about offering this service as a premium complement to authenticated subscribers. Noggin will feature an abundant volume of long- and short-form content for preschoolers, with additional content added regularly. Noggin's content at launch will include award-winning, education-based series, including: the ground-breaking Blue's Clues, Little Bear and Ni Hao, Kai-lan, among others; music videos featuring kids' favorite Nick preschool characters; and the return of the beloved Moose and Zee characters hosting educational videos that can help kids learn letters, shapes, matching and other important skills to get ready for kindergarten. Introducing Noggin from Viacom on Vimeo. New content, games and activities will be added regularly. Noggin's content will remain library-based, separate and distinct from Nickelodeon's preschool content currently available on its existing distribution platforms. "We are reintroducing the Noggin name with this new mobile service because of its built-in equity with moms and as a signal of the high-quality preschool content that will be curated for it," said Cyma Zarghami, President, Viacom Kids and Family Group. The titles available on Noggin at launch include: Allegra's Window, Blue's Clues, Blue's Room, Franklin and Friends, Gullah Gullah Island, Little Bear, Miss Spider's Sunny Patch Friends, Ni Hao, Kai-lan, Oswald, Pocoyo, Robot and Monster and The Upside Down Show. 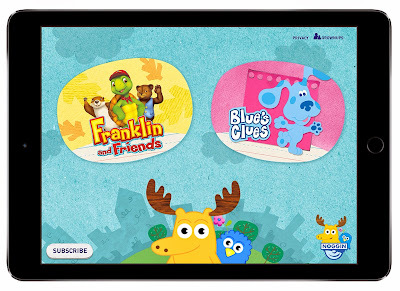 Noggin serves as a complement to the highly successful Nick Jr. app, a TV Everywhere platform for preschoolers. The Nick Jr. app features a live linear feed of the Nick Jr. television channel and on-demand episodes of the net's current series, via paid-TV subscriber authentication, plus interactive activities and educational moments. To date, Nickelodeon has launched more than 20 preschool apps including top-performing titles like Blaze and the Monster Machines (STEM), PAW Patrol Rescue Run (problem-solving and social skills), Wallykazam! Letter and Word Magic (literacy), and the award-winning Nick Jr. Draw and Play (creativity and imagination). Nickelodeon, now in its 35th year, is the number-one entertainment brand for kids. It has built a diverse, global business by putting kids first in everything it does. The company includes television programming and production in the United States and around the world, plus consumer products, digital, recreation, books and feature films. Nickelodeon's U.S. television network is seen in more than 100 million households and has been the number-one-rated basic cable network for 20 consecutive years. For more information or artwork, visit http://www.nickpress.com. Nickelodeon and all related titles, characters and logos are trademarks of Viacom Inc. (NASDAQ: VIA, VIAB). NEW YORK--(BUSINESS WIRE)--Nickelodeon today at its annual upfront presentation formalized its robust roster of consumer insights, partnership marketing and multi-media services under the banner of Nickelodeon Inside Out Solutions. An offering that connects partners to the full scope of Nickelodeon's unrivaled intellectual properties and 10-screen ecosystem, Nickelodeon Inside Out Solutions offers branded entertainment and intellectual property alignment opportunities across the network's media platforms, social footprint, consumer products business and on-the-ground marketing experiences. "Nickelodeon Inside Out Solutions signals our commitment to collaborative partnerships," said Pam Kaufman, Chief Marketing Officer and President of Consumer Products, Nickelodeon. "We're opening our doors to clients so that we may work better together to leverage the full power of the Nickelodeon ecosystem, with all of the possibilities for building and marketing our partners' messages now in one place." Nickelodeon Inside Out Solutions offers advertising partners the opportunity for in-depth collaboration with expertise drawn from all quarters of the Nickelodeon organization. Partners can access the network's proprietary insights, full-service marketing and creative resources and multi-platform media destinations to create branded experiences that are authentic to Nickelodeon's kids and family audience. Throughout the year, the network will roll out additional offerings through Nickelodeon Inside Out Solutions, inclusive of a new way for partners to leverage Nick's robust social footprint for appropriate audiences and new measurement capabilities, which will inform partners of the reach, influence and engagement of their social programs. Details will be available this spring. Nickelodeon, now in its 35th year, is the number-one entertainment brand for kids. It has built a diverse, global business by putting kids first in everything it does. The company includes television programming and production in the United States and around the world, plus consumer products, online, recreation, books and feature films. Nickelodeon's U.S. television network is seen in almost 100 million households and has been the number-one-rated basic cable network for 20 consecutive years. For more information or artwork, visit www.nickpress.com. Nickelodeon and all related titles, characters and logos are trademarks of Viacom Inc. (NASDAQ: VIA, VIAB). Pictured: (L-R) Jodi (Louriza Tronco), Sun Hi (Meghan Lee) and Corki (Erika Tham) in the new live-action series, Make It Pop, coming to Nickelodeon in the 2015-16 season. Photo Credit: Nickelodeon. ©2015 Viacom International, Inc. All Rights Reserved. NEW YORK--(BUSINESS WIRE)--Following its success with the daily, serialized format of hit shows like Every Witch Way and House of Anubis, Nickelodeon is picking up three more daily scripted series for the upcoming season. These new live-action shows include: Make It Pop, a comedic, music-infused daily strip about three girls who come together to start their own K-Pop-inspired band; Talia's Kitchen (working title), which follows a teenage girl who goes to work in her grandmother's Miami restaurant and finds that her talent for cooking is, quite literally, magical; and The W.I.T.s Academy (working title), a spin-off from Every Witch Way about the comedic adventures of young witches- and wizards-in-training. Nick is also renewing Every Witch Way for a fourth season and Max & Shred for season two. "Between the enormous amount of shows we have in production, and the strong foundation of our recent launches, we are giving our audience some of the most fresh and innovative content we've ever produced," said Russell Hicks, President, Content Development and Production, Nickelodeon. "The new daily scripted shows we've picked up are right in line with kids' demand for more content, in different formats, and we can't wait for kids to see and love them." * Make It Pop (20 episodes) is a comedic, music-infused daily strip about three unique girls who come together to start their own K-Pop-inspired band. Randomly selected to room together at boarding school, bookish Corki, fashion-forward Jodi and social media maven Sun Hi meet and bond over music. With the help of fellow boarding school classmate and DJ hopeful, Caleb, the girls grow from roommates to bandmates as they become a school-wide sensation and compete for a place in the upcoming school musical. The series, which will feature original songs and performances in every episode, is co-created by Thomas W. Lynch and Nick Cannon and produced by DHX Media. Make It Pop is executive produced by Lynch and Cannon, together with Steven DeNure and Anne Loi for DHX Media. * Talia's Kitchen (working title; 40 episodes) is a live-action series, inspired by the daily telenovela format that follows 14-year-old Talia who moves in with her grandmother and starts spending time in the kitchen of their family-owned restaurant. There, she discovers her true calling: cooking. With the help of her special "salt and pepper sense"--and her late father's magical spices--Talia is able to infuse emotion into her food and cook just what each customer needs. Talia's Kitchen is created by Catharina Ledeboer and produced by Viacom International. Tatiana Rodriguez will serve as Executive Producer. * The W.I.T.s Academy (working title; 20 episodes) is a daily strip spun off from the hit Every Witch Way. In this new series, teenage Guardians will oversee young witches- and wizards-in-training at a magical academy. There, the Guardians will have to decide who is friend, and who is foe. The series is created by Catharina Ledeboer and is produced by Viacom International. The W.I.T.s Academy is executive produced by Tatiana Rodriguez. Also announced today was the season four renewal of Every Witch Way, which ranked number one in its timeslot with both kids and tweens during its third season, and season two of Nick's live-action buddy-comedy, Max & Shred. Scheduled to premiere this summer, the new season of Every Witch Way follows 14-year-old Emma Alonso, whose life is turned upside down when she moves to Miami and discovers that she is the Chosen One, the most powerful witch in existence. She must keep the Magical Realm safe while balancing school, friendships and romance. Every Witch Way is written by Catharina Ledeboer (Grachi, Hollywood Heights, General Hospital) and produced by Nickelodeon Latin America and Cinemat. Max & Shred chronicles the hilarious and unlikely friendship between Max Asher, a celebrity snowboarder, and Alvin "Shred" Ackerman, a science whiz-kid, who become roommates when Max moves to Colorado to train for the Winter Cup. Max & Shred was created by Josh Greenbaum and Ben McMillan, and executive produced by George Doty IV, Joan Lambur, Ira Levy, Peter Williamson, Nat Abraham and Michael McGuigan. The series is produced by Breakthrough Entertainment for Nickelodeon and YTV. Nickelodeon, now in its 35th year, is the number-one entertainment brand for kids. It has built a diverse, global business by putting kids first in everything it does. The company includes television programming and production in the United States and around the world, plus consumer products, online, recreation, books and feature films. Nickelodeon's U.S. television network is seen in more than 100 million households and has been the number-one-rated basic cable network for 20 consecutive years. For more information or artwork, visit http://www.nickpress.com. Nickelodeon and all related titles, characters and logos are trademarks of Viacom Inc. (NASDAQ: VIA, VIAB). Pictured: (L-R) Cesar Millan, Calvin Millan and Stuff in Mutt & Stuff, a new live-action preschool series coming to Nickelodeon in the 2015-16 season. Photo Credit: Nickelodeon. ©2015 Viacom International, Inc. All Rights Reserved. 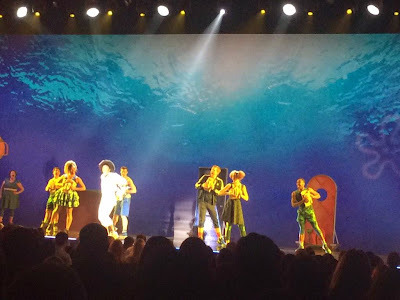 NEW YORK--(BUSINESS WIRE)--Nickelodeon, at its annual upfront presentation held today at the Skylight at Moynihan Station, outlined the power of its unmatched, 10-screen ecosystem to deliver the biggest and most engaged audience of kids and families, and announced numerous key initiatives from its content pipeline. The new series and development projects underscore Nick's commitment to fresh and innovative formats, from a wide range of creative sources and voices. Announcements at the presentation included: Noggin, a mobile subscription service for preschoolers; numerous new content innovations; a sneak peek at a potential SpongeBob SquarePants Broadway musical; future spinoff possibilities for the wildly successful Teenage Mutant Ninja Turtles franchise; and Nickelodeon Sports, which brings content from the major sports leagues to Nick's platforms. Nickelodeon also detailed the suite of its partner services that provides consumer insights, advertising solutions and branded-entertainment opportunities, now formalized under the banner of Nickelodeon Inside Out Solutions. The presentation was augmented by an appearance from Will Arnett--star of Paramount Pictures' global theatrical hit, Teenage Mutant Ninja Turtles, and the forthcoming sequel set for 2016; a performance of a song from the SpongeBob SquarePants musical, currently being developed for a potential Broadway debut; and a closing set of songs by pop hit-makers, Echosmith. "The proliferation of platforms and massive amounts of new content are having an unprecedented impact on entertainment, and we are using these opportunities to super-serve our audience with fresh content, new formats and innovative storytelling," said Cyma Zarghami, President, Viacom Kids and Family Group. "We remain laser-focused on using all of the screens and tools in our ecosystem to deliver the biggest audience of kids and families, and creating hits and building franchises that thrill our audience and deliver unrivaled reach." Nickelodeon highlighted a selection of content drawn from its pipeline, with each project showcasing the network's commitment to reinvent genres and introduce new formats and ideas to its audience. * Game Makers (working title), just picked up for 26 episodes, is the newest creation from hit-maker Dan Schneider. It's a live-action sitcom about two 12-year-old girls who start a multi-million-dollar gaming company and take on rap superstar Double G as a business partner. As part of a multi-platform experience, the games seen in the episodes will be released through apps and online. Schneider will also serve as Executive Producer. * Make It Pop, picked up for 20 episodes, is a comedic, music-infused daily strip about three unique girls who come together to start their own K-Pop-inspired band. Randomly selected to room together at boarding school, bookish Corki, fashion-forward Jodi and social media maven Sun Hi meet and bond over music. With the help of fellow boarding school classmate and DJ hopeful, Caleb, the girls grow from roommates to bandmates as they become a school-wide sensation and compete for a place in the upcoming school musical. The series, which will feature original songs and performances in every episode, is co-created by Thomas W. Lynch and Nick Cannon and produced by DHX Media. Make It Pop is executive produced by Lynch and Cannon, together with Steven DeNure and Anne Loi for DHX Media. * Talia's Kitchen (working title), just picked up for 40 episodes, is a live-action series inspired by the daily telenovela format that follows 14-year-old Talia who moves in with her grandmother and starts spending time in the kitchen of their family-owned restaurant. There, she discovers her true calling: cooking. With the help of her special "salt and pepper sense"--and her late father's magical spices--Talia is able to infuse emotion into her food and cook just what each customer needs. Talia's Kitchen is created by Catharina Ledeboer and produced by Viacom International. Tatiana Rodriguez will serve as Executive Producer. * Mutt & Stuff, which has just been picked up for 20 episodes, is a live-action preschool series produced by Sid and Marty Krofft. 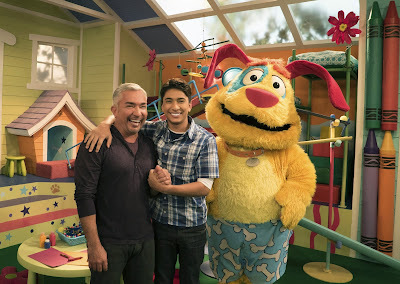 Set in a unique school for dogs, the series stars Calvin Millan, The Puppy Whisperer and son of The Dog Whisperer, Cesar Millan, interacting with a cast of real dogs and puppets. Mutt & Stuff is filled with unbelievable dog tricks, adorable puppies, and alternating moments of heart and comedy. The series is created and executive produced by Sid and Marty Krofft and Bradley Zweig. Cesar Millan also serves as Executive Producer. * Roll Call (working title), which is currently in development, is a single-camera comedy series shot in a mockumentary style that follows an eclectic group of kids navigating their way through middle school. Roll Call is executive produced by Sharla Sumpter Bridgett and directed by Ian Pfaff. Nickelodeon also announced a spin-off of its hit Every Witch Way— The W.I.T.s Academy (working title; 20 episodes). The W.I.T.s Academy will be a daily strip about the comedic adventures of witches- and wizards-in-training. The series is created by Catharina Ledeboer and is produced by Viacom International. The W.I.T.s Academy is executive produced by Tatiana Rodriguez. "We remain focused on developing breakthrough content that is more fresh and innovative than anything else available anywhere," said Russell Hicks, President, Content Development and Production, Nickelodeon. "Our new slate builds on a strong foundation of recent launches that is connecting with this new generation of kids." * Among the new series this season are: School of Rock, a live-action show based on the hit movie, and Nick's first collaboration with Paramount Television; Harvey Beaks, an animated show about a good kid who has never broken the rules, and his two best friends, who have never lived by any; and Shimmer and Shine, an animated, curriculum-based preschool series about twin genies-in-training who unintentionally cause chaos in their attempts to grant wishes for their best friend, Leah. * Nick's returning series feature second seasons of new live-action hits Henry Danger, Nicky, Ricky, Dicky & Dawn and Max & Shred; season four of the live-action, daily series, Every Witch Way; plus more new episodes of SpongeBob SquarePants, Teenage Mutant Ninja Turtles, The Thundermans, Bella and the Bulldogs, Sanjay and Craig, Breadwinners, The Fairly OddParents, PAW Patrol, Wallykazam!, Dora and Friends and Blaze and the Monster Machines, among others. 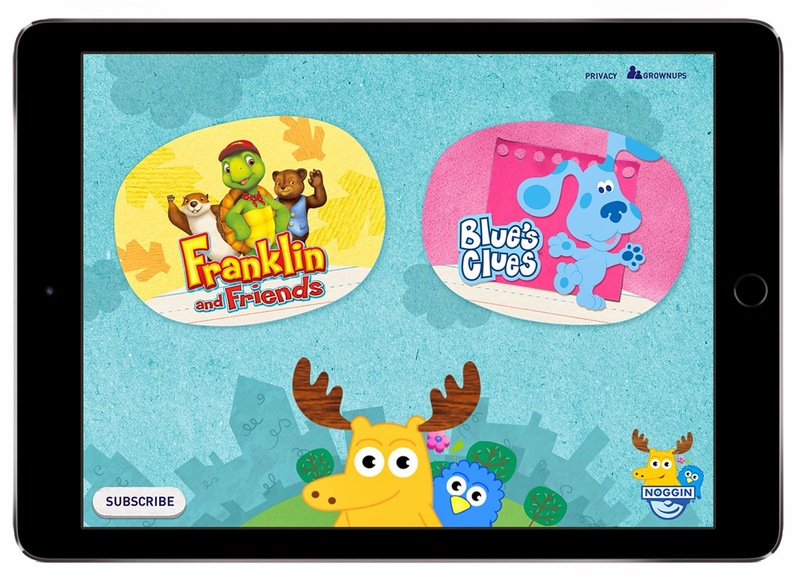 * Noggin--Nickelodeon is launching Noggin, a new mobile subscription service for preschoolers. Available on the App Store for iPhone, iPad and iPod touch starting March 5, the paid service will be ad-free and offered for $5.99 a month. Nickelodeon is also in discussions with distributors about offering this service as a premium complement to authenticated subscribers. Noggin will feature an abundant volume of long- and short-form content for preschoolers, with additional content added regularly. Noggin's content at launch will include: award-winning, education-based series, including the ground-breaking Blue's Clues, Little Bear and Ni Hao, Kai-lan, among others; music videos featuring kids' favorite Nick preschool characters; and the return of the beloved Moose and Zee characters hosting educational videos that can help kids learn letters, shapes, matching and other important skills to get ready for kindergarten. New content, games and activities will be added regularly. Noggin's content will remain library-based, separate and distinct from Nickelodeon's preschool content currently available on its existing distribution platforms. * Nickelodeon Sports--Nick's sports initiative encompasses the brand's established relationships with major sports leagues, including NFL, NBA, MLS, NHL and NASCAR, across a myriad of off-channel activations, including pro-social initiatives and marketing partnerships. In 2014, Nickelodeon expanded its sports presence to include programming with its inaugural Kids' Choice Sports Awards, hosted and executive produced by Michael Strahan, and the launch of NickSports. Launched on Nicktoons last fall, NickSports is a primetime (Wednesdays from 9-11 p.m. ET) programming block that features a rotating lineup of sports-themed content including series, specials and documentaries from sports leagues and celebrity athletes, as well as acquired theatrical movies. Also outlined was Nickelodeon Inside Out Solutions, Nickelodeon's newly named integrated marketing and creative content offering for partners. Nickelodeon Inside Out Solutions is a collaborative service that connects partners to the strengths of Nickelodeon's platforms and unrivaled characters, and makes available Nick's audience expertise, creativity, advertising solutions and branded-entertainment opportunities. Nickelodeon Unveils New Preschool Subscription Video-On-Demand Service "Noggin"
Nickelodeon, the number-one entertainment brand for kids and families, today announced that they are relaunching their Noggin brand as a brand-new streaming video subscription service aimed at preschoolers, handing consumers another way to get high-quality video without the need for cable or satellite! The service, unveiled at the networks annual upfront pitch, Nickelodeon Upfront, to ad buyers, will cost $5.99 per month and will be available for iPhone, iPad and iPod Touch starting Thursday 5th March 2015. It will feature on-demand long- and short-form educational series and preschool music videos, all without ads. Initial programming will include Nick Jr. favorites such as "Blues Clues", "Franklin and Friends" and "Little Bear", music videos featuring Nick characters, and viewer favorite hosts Moose A. Moose and Zee, a moose-and-bird duo who hosted the linear Noggin. Nickelodeon is also in conversations with distributors about offering the service as a premium complement to authenticated cable and satellite TV subscribers, it said. Noggin is envisioned as a complement to the company’s Nick Jr. app, which shows a live, linear feed of the Nick Jr. preschooler cable network for people who already subscribe to it. Noggin's content will also remain separate and distinct from Nickelodeon's preschool content already available on its existing distribution platforms. Noggin was previously its own preschool cable channel in the USA. The channel was renamed Nick Jr. as part of Nickelodeon's network wide rebranding. 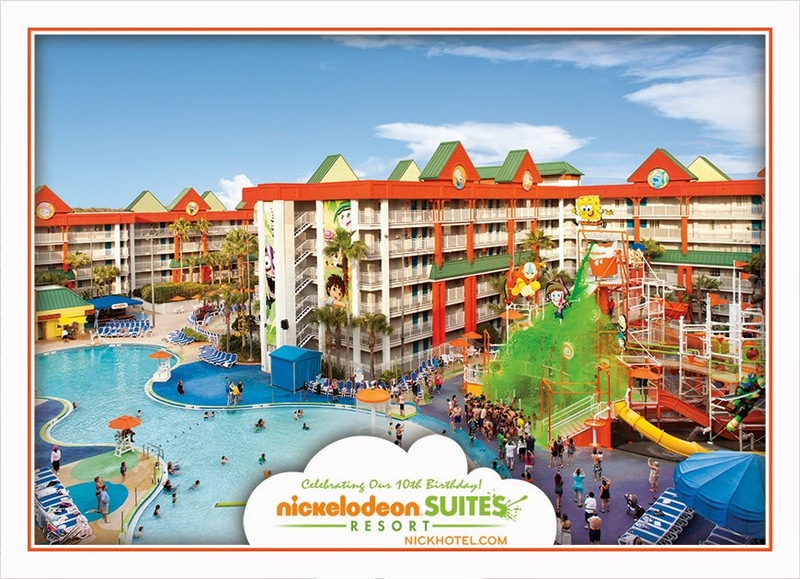 ORLANDO, Fla.--(BUSINESS WIRE)--Nickelodeon Suites Resort is getting ready for a year-round birthday extravaganza as the hotel celebrates ten years of entertaining guests from all over the world. Beginning the weekend of March 6-8, 2015, the resort will host a weekend-long birthday event each month through November, featuring exciting shows, poolside entertainment, Nickelodeon characters, Slime and lots of surprises. "At Nickelodeon Suites Resort, we always have so much to celebrate — even more so this year," said Tony Aslanian, Director of Sales and Marketing for Nickelodeon Suites Resort. "What better way to commemorate 10 years of fun with our guests than with incredible birthday entertainment, featuring some of our favorite Nickelodeon friends. It will be a celebration that Nick fans won't want to miss!" - from NickALive! on Vimeo. Fans of Nickelodeon Suites Resort will also have the opportunity to leave birthday wishes for the hotel on Facebook and Twitter using #HBDNICKHOTEL. A full calendar of Birthday Weekend dates, as well as other events on property can be found at www.nickhotel.com/hbd. Zodiak Kids has announced the exciting news in the following press release that Nickelodeon USA will start to premiere and show "Get Blake! ", Marathon Media's brand-new exciting cartoon style comedy series filled with visual gags and delirious characters, developed in partnership with Nickelodeon and Gulli, from April 2015! 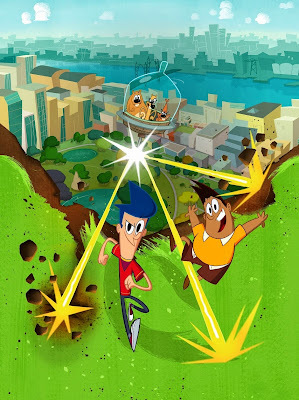 The brand-new animated series will make its debut on NickToons UK on Monday 2nd March 2015 and on France's Gulli during Autumn/Fall 2015. Additionally, Zodiak Kids has also announced in the same press release, below that they secured presales for "Get Blake!" in Europe with De Agostini Editore and JKN Global in Asia. "Get Blake!" (56x11'), formally titled "Blake and the Aliens", is Marathon Media's latest action comedy for kids everywhere. Each 11-minute episode follows Blake Myers, a fearless, adventure-seeking kid as he races headlong into all of life's experiences along with his best friend Mitch. What's impressive about Blake is that he lives for today, despite knowing the awesomeness that awaits him in the future: Blake is destined to become a courageous Space Ranger and protector of humankind against a marauding race of... ALIEN squirrels! These alien squirrels – or "Squaliens" – have been sent from the future by their Squalien General. Their mission: is to make sure Blake Myers never grows up to be Blake Myers, Space Ranger. Hero. Defeater of Squaliens. From their super high-tech command center – now cunningly disguised as a regular earth tree in Blake's very own backyard – the Squaliens must use everything they have at their disposal to put an end to Blake Myers. The series boasts world-renowned creative teams with long-standing credentials in animation including director Daniel Klein, executive producer Eryk Casemiro; and Derek Dressler ("Kick Buttowski", "Johnny Test", "Breadwinners" and "Annoying Orange"), who supervised the writing, and features a American comic sensibility whilst preserving the distinctive French artistic style. Zodiak Kids Announces Presales For Get Blake! Zodiak Kids has secured presales for its production company Marathon Media’s brand new series Get Blake! in Europe with De Agostini Editore and JKN Global in Asia, the company announced today. De Agostini Editore have acquired the comedy cartoon for their Italian kids channel Super!. Get Blake! has also been presold to JKN Global for their JKN and Bright Channels in Thailand. Get Blake! is set to premier in the UK on Nickelodeon channel Nick Toons on 2nd March 2015, which will be followed by launches on Nickelodeon US in April and Gulli in the Autumn. The series boasts world-renowned creative teams with long-standing credentials in animation including director Daniel Klein, executive producer Eryk Casemiro; and Derek Dressler (Kick Buttowski, Johnny Test, Breadwinners and Annoying Orange), who supervised the writing. Zodiak Kids holds worldwide TV and licensing rights to the series. Follow NickALive! on Twitter, Tumblr, Google+, via RSS, on Instagram, and/or Facebook for the latest Nickelodeon and Get Blake! News and Highlights! NICKELODEON AND PAPERCUTZ ANNOUNCE "FIRST LOOK DEAL"
February 5, 2015 – New York, NY – Nickelodeon and Papercutz, the industry leader in children's graphic novel publishing, are proud to announce an innovative first look deal, the first agreement of its kind that the network has made with a graphic novel publisher. The partnership will give Papercutz the first option to adapt all-new Nickelodeon original properties into comics and graphic novels. "Papercutz's strong track record with licensed properties for kids made them our ideal choice for a publishing partner," explained Linda Lee, VP of Nickelodeon Domestic Publishing. "As we grow our stable of original animated properties, we wanted to work with a company that could reach the broadest possible audience. We're excited to work with the Papercutz team and we look forward to adding the Nickelodeon characters to one of the most diverse lists offered by any children's publisher." The first two properties slated for launch in Papercutz books are Nickelodeon's hits, SANJAY AND CRAIG and BREADWINNERS. SANJAY AND CRAIG is the story of an adventurous 12-year-old boy who proves the old adage: there's nothing you can't accomplish (or destroy) as long as your best friend is a talking snake. The adventures of this dude-snake duo have been a ratings smash for Nickelodeon with the series ranking as the #2 animated show across all TV among kids 2 to 11. 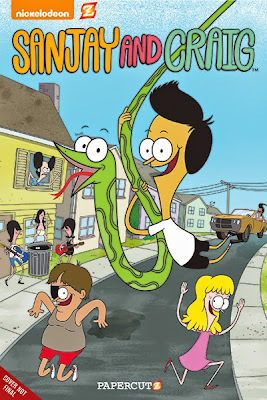 SANJAY AND CRAIG is set to make its graphic novel debut in September 2015, just in time for the premiere of the series' third season on Nickelodeon. BREADWINNERS features the adventures of SwaySway and Buhdeuce, two carefree ducks who fly around in a super sweet rocket van, delivering bread to hungry beaks everywhere. 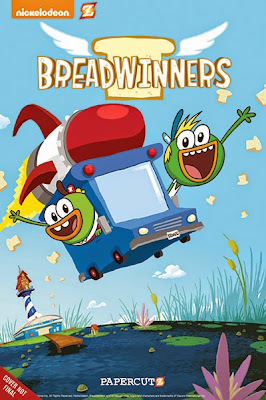 Like SANJAY AND CRAIG, BREADWINNERS has been an instant hit with kids. These "quazy ducks" will join the Papercutz lineup with their first graphic novel in October 2015 and comics will never be the same! "Our partners at Nickelodeon have created some terrific characters that really reach out to kids," said Papercutz Editor-in-Chief Jim Salicrup. "And we can't wait to translate that magic into the graphic novel format. Of course, the best part of this deal is getting to see what they're working on next! SANJAY AND CRAIG and BREADWINNERS are just the start of a really exciting publishing program that's sure to keep kids thoroughly entertained and clamoring for more!" Nickelodeon, now in its 35th year, is the number-one entertainment brand for kids. It has built a diverse, global business by putting kids first in everything it does. The company includes television programming and production in the United States and around the world, plus consumer products, online, recreation, books and feature films. Nickelodeon's U.S. television network is seen in more than 100 million households and has been the number-one-rated basic cable network for 20 consecutive years. For more information or artwork, visit http://www.nickpress.com. Nickelodeon and all related titles, characters and logos are trademarks of Viacom Inc. (NASDAQ: VIA, VIA.B). Follow NickALive! on Twitter, Tumblr, Google+, via RSS, on Instagram, and/or Facebook for the latest Nickelodeon, Sanjay and Craig and Breadwinners News and Highlights! 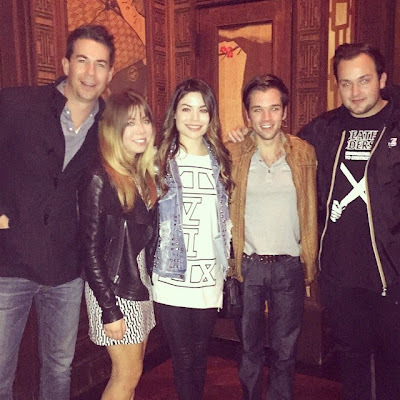 It's the "iCarly" reunion we always knew we wanted!! The stars of the hit Nickelodeon show "iCarly" got together for a special mini reunion tonight! Miranda Cosgrove shared a exclusive photo on her official Instagram account in which Miranda, Jennette McCurdy, Nathan Kress, Noah Munck, and Jerry Trainor all pose together! "Got to see these guys tonight :)," Miranda captioned the picture. Jennette posted a black and white version on her official Instagram account, writing, "Regram from @mirandacosgrove ! So great seeing these friends...(Miranda and me) (Noah and Nathan) (Jerry)"
"iCarly" ran on Nickelodeon from 2007-2012 and followed Carly Shay (Cosgrove), a girl who hosted her own home-grown web show with her best friends Sam Puckett (McCurdy) and Freddie Benson (Kress). 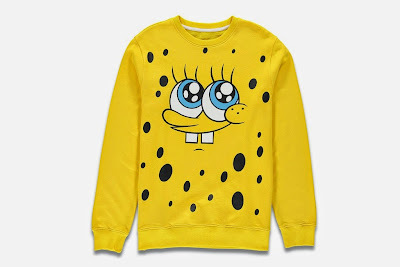 To celebrate the North American theatrical release of Nickelodeon Movies and Paramount Animation's brand-new SpongeBob SquarePants movie, "The SpongeBob Movie: Sponge Out of Water", fashion retailer Forever 21 and Nickelodeon, the number-one entertainment brand for kids, recently launched a exclusive collection of limited-edition women's, men's and girl's apparel and accessories! 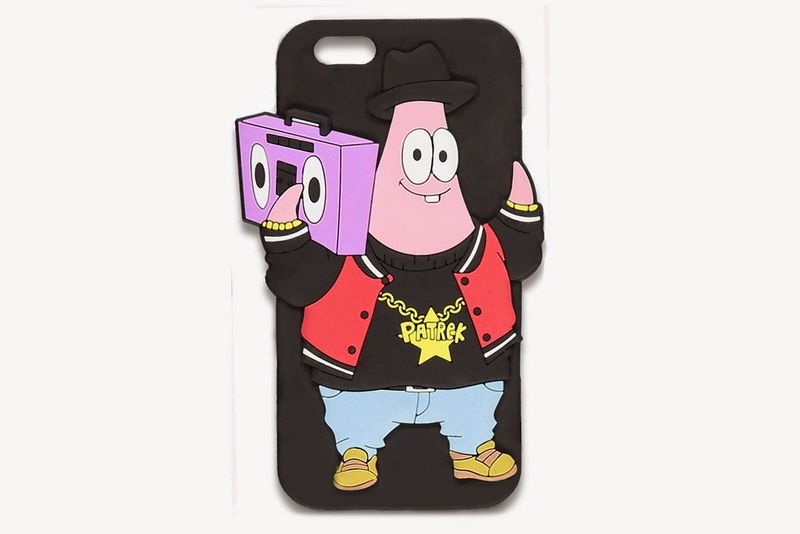 Entitled "Forever 21 x SpongeBob SquarePants", the collection features favorite SpongeBob SquarePants characters including SpongeBob SquarePants, Patrick Star, Squidward Tentacles, Mr. Krabs and Squilliam Fancyson, designed and curated by Korean based artist and illustrator Mina Kwon, in partnership with Nickelodeon, for Forever 21. Mina's cartoon drawings have amassed a global following and her distinct style translates effortlessly with the iconic "SpongeBob SquarePants" characters. 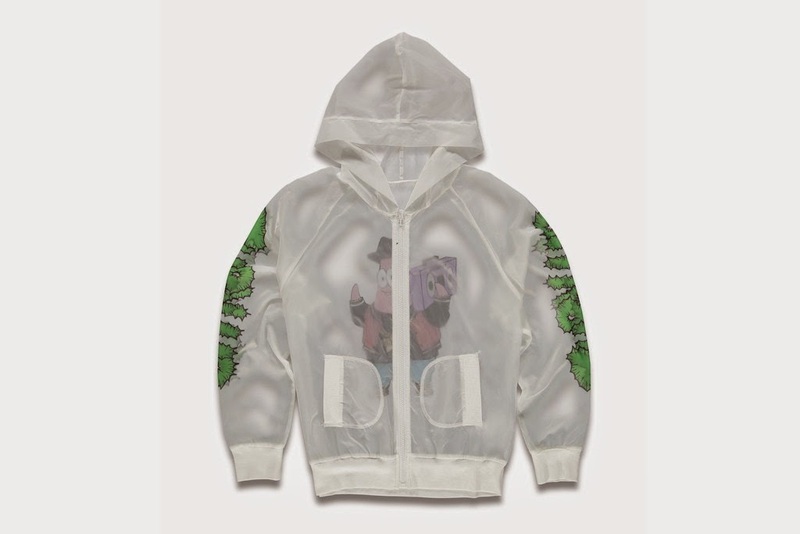 Mina also includes her distinctive, street-culture aesthetic in her range by adding playful phrases, such as like "Turn Up" and "Ssup" into the range to the designs. Forever 21 launched their "Forever 21 x SpongeBob SquarePants" collection at a special launch party at the retailers flagship Times Square location in New York City, on Friday 6th February 2015. The launch party featured character appearances, snacks, DJ, nail art and much more. 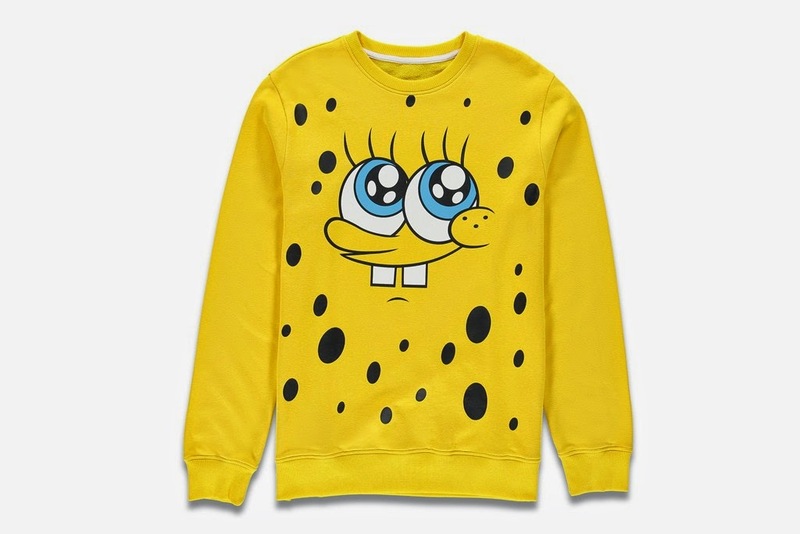 The Forever 21 SpongeBob SquarePants x Mina Kwon Collection is now available at select Forever 21 stores across the USA and online on the retailers official website, Forever21.com. 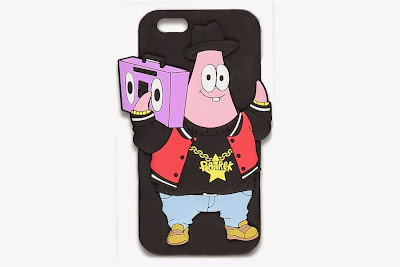 A favorite among celebrities including Pharrell Williams, Mina Kwon's cartoon drawings have racked up an international following due to her distinctive style. Sources: Forever21.com, StyleBlazer.com, License! Global, WWD.com.